CarGurus has 1,102 nationwide VUE listings starting at $1,800. Saturn gives drivers more choices for 2009 by adding two new fuel-efficient VUE trims, including a new 2-Mode Hybrid trim that delivers the best fuel economy of any vehicle in its class. While many drivers give the VUE's interior good marks overall, many find the seats too stiff and lacking sufficient support, and the cargo space in the compact SUV comes up short when compared to some competitors' vehicles. The 2009 Saturn VUE compact SUV, now in the second year of a redesign, represents a good value for drivers and offers a wide range of standard features, including numerous storage spaces, that will meet the daily needs of most drivers. Four-cylinder trims sometimes lack the pep some drivers would like to see for aggressive driving, and V6-powered trims don't deliver the fuel efficiency some drivers require. But as a daily commuter, the '09 Saturn VUE offers a comfortable ride and numerous safety features that make it a good purchase for small families. Saturn unveils two new additions to the VUE's lineup for 2009. The Saturn VUE 2-Mode Hybrid trim, which arrives in the spring of '09 in limited numbers, combines two electric motors with a 3.6-liter gas-powered V6 engine, resulting in a powerplant that provides plenty of drive as well as class-leading fuel economy, according to the automaker. Saturn contrasts the new 2-Mode Hybrid with the existing VUE Hybrid trim by referring to the former as a "full hybrid" and the latter as a "mild hybrid." At least for the time being, both will continue to exist in the VUE's lineup. In addition, Saturn drops a four-cylinder engine into its premium VUE XR trim, continuing a trend among automakers to offer fuel-efficient vehicles with upscale features. The new trim, called the XR-4, joins the previously available entry-level XE trim, the newly renamed XR-V6 trim, and the performance-oriented Red Line. The XE, XR-V6, and Red Line trims come in either front-wheel-drive or all-wheel-drive configurations, while the new XR-4 and both hybrids are front-wheel-drive vehicles only. Other than the addition of two new trims, Saturn makes few changes to the VUE for 2009, carrying over the well-received design introduced in 2008. Like many of GM's current vehicles, the VUE borrowed heavily from the automaker's European-based Opel division, incorporating styling cues from the Opel Antara. The 2009 VUE 2-Mode Hybrid features two 55-kilowatt electric motors powered by a 300-volt nickel-metal hydride hybrid battery pack. In the first mode, which drives the SUV at speeds under 40 mph, the automatic transmission shifts power between one of the electric motors, the gas engine, or both the gas engine and an electric motor, while the other electric motor recharges an array of 22 batteries, located under the cargo floor. In Mode 2, which takes over at higher speeds, the V6 engine provides the primary power, assisted by the electric motors when additional power is required, such as when towing a trailer or climbing steep hills. This helps maximize power as well as fuel efficiency, especially at higher speeds. The gas engine shuts down when the SUV decelerates or idles, and the electric motors alone provide the power to drive the SUV in reverse mode. The electric motors and V6 engine link to a two-mode continuous variable transmission (CVT) with four fixed gears. Working seamlessly together, the electric motors and gas engine drive the VUE 2-Mode Hybrid from 0 to 60 in 7.3 seconds and enable the VUE to tow up to 3,500 pounds, while delivering up to a 50 percent improvement in fuel efficiency, compared to a conventional engine. The EPA estimates highway mileage at 32 mpg, making the 2-Mode one of the most fuel-efficient SUVs available today. A 169-hp, 2.4-liter Ecotec four-cylinder gas engine continues to provide the power for the XE trim, as well as the XR-4 trim, while the XR-V6 and Red Line trims are powered a 257-hp, 3.6-liter V6 with variable valve timing, which carries over from the previous year. 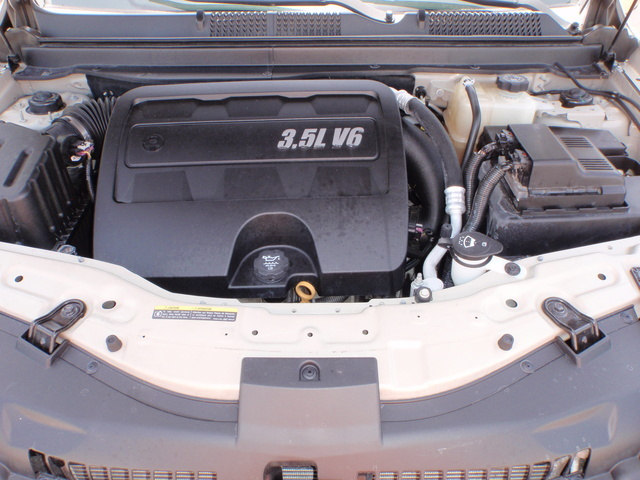 Naturally, fuel economy suffers for trims with all-wheel-drive or the more powerful V6 engine. The front-wheel-drive four-cylinder XE ekes out a respectable 19/26, but that drops to 15/22 for the XE with all-wheel drive, while mileage for the XR and Red Line trims averages around 16/23. All four-cylinder engines link to a four-speed automation transmission, while the V6 engine links to a six-speed automatic transmission. The Red Line VUE adds the TAPshift feature, which enables drivers to shift manually using paddle shifters on the steering wheel. All engines run on regular gasoline. The Saturn VUE rides on a MacPherson front suspension and an independent four-link rear suspension, tuned for a soft, sedan-like ride. The only exception is the Red Line, which features a lowered, sport-tuned suspension. Overall, the VUE offers a smooth, comfortable ride, but some reviewers note that at times the ride can seem a bit too soft, such as when cornering or stopping quickly. The Red Line, with its sport-tuned suspension, delivers a firmer ride, while the new 2-Mode Hybrid features a specially tuned suspension that also delivers a more capable ride than the standard VUE trims. The 2-Mode's suspension was retuned and its front struts and rear shock absorbers recalibrated to accommodate weight differences that result from the battery pack and other components of the hybrid system. Reviewers note that the four-cylinder and Hybrid VUE trims provide capable acceleration and performance around town and at highways speeds up to about 65 mpg, but beyond that the engines drop off in performance. Some reviewers also note that the VUE's steering feels less precise than it should. However, V6 trims add hydraulic-assist power steering, tuned for optimal responsiveness, which improves on the standard steering package. Reviewers generally give good marks to the layout of interior controls, which are easy to adjust, thanks to large knobs. However, the cruise control buttons on the steering wheel are small and difficult to use, according to some reviewers. Many drivers of VUEs produced in earlier years commented on excessive road noise, but Saturn has taken steps to keep road noise minimal in the current trims, and has succeeded in ensuring a quiet ride, according to drivers and reviewers. The Saturn VUE seats five passengers in two seats. Overall, the VUE gets good marks for its European-influenced interior, which reviewers call clean, comfortable, and roomy. Many drivers and reviewers especially like the interior's high-quality materials, which avoid a plastic, cheesy look. The seats are comfortable and accommodating, but not overly cushioning. Both front and back seats offer plenty of legroom and headroom for most drivers and passengers. Standard features for the XE trim include deluxe front bucket seats, power windows and door locks, cruise control, remote keyless entry, steering-wheel-mounted controls for the audio system, and a six-speaker AM/FM audio system with an MP3 input jack and XM satellite radio. The XR adds a Preferred Package that includes an eight-way power-adjustable driver's seat, a leather-wrapped steering wheel, heated exterior mirrors, and Bluetooth. The Red Line adds upgraded front seats equipped with ebony bolsters with perforated seating inserts. The VUE offers just over 29 cubic feet of cargo space with the second row of seats in place, which comes up short when compared to competitors' vehicles, but should be adequate for most drivers' daily use. Cargo space expands to just over 56 cubic feet with the 60/40 split second-row seats folded down. The VUE provides plenty of interior storage space, including a pull-out storage compartment on the dashboard left of the steering wheel and another one under the front passenger seat. Some note that the center console between the front seats sits too low, so drivers have to reach down to retrieve drinks and items stored in the console. However, many like the storage nets in the rear cargo space. The 2009 Saturn VUE received a five-star crash safety rating, the highest available, from the National Highway Traffic Safety Administration, and was named a Top Safety Pick by the Insurance Institute for Highway Safety, making it one of the safest vehicles in its class. Saturn notes that the VUE comes equipped with 137 safety features, including six standard airbags, active head restraints, daytime running lights, and a pedal release system. emergency maneuvers. Saturn also includes a complete range of OnStar features as standard equipment on all VUE trims, including OnStar automatic crash response, emergency services, roadside assistance, remote door unlock, and vehicle diagnostics. Reviews from drivers echo many of the comments made above. Drivers like the VUE's comfortable interior, with its extensive use of upscale materials, as well as its overall fit and finish. Most find the seats comfortable and easy to pull down, although some think the seats are too stiff and lack sufficient support. Drivers like the VUE's numerous and unique storage spaces. In addition, they note that the VUE handles well, especially in turns and in inclement weather conditions. Drivers also give high marks to the VUE's many safety features. On the downside, many note that the cupholders in the center console are too low, and some find the interior a bit too tight when the VUE is fully loaded with passengers and cargo. CarGurus drivers like the VUE's peppy acceleration, exterior styling, and comfortable interior, and find the compact SUV easy to get into and out of. They like the layout of the instrument panel, the MP3 audio jack, and the interior heating and cooling system. On the downside, some taller drivers find the ceiling a bit too low, while others would like to see better gas mileage out of the V6 engine. 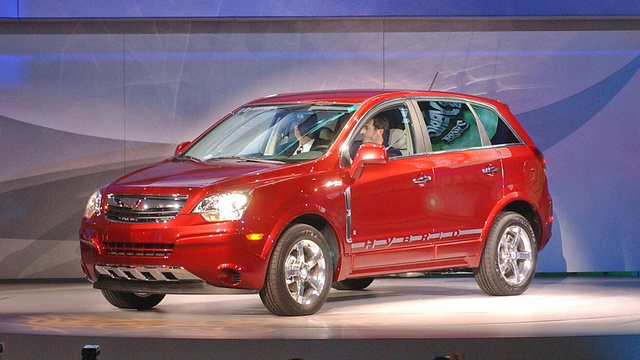 What's your take on the 2009 Saturn VUE? Have you driven a 2009 Saturn VUE? Do I need synthetic oil for my car? i have a 2tire lkocatede 2009 saturen vue hybrib where is the spare ? 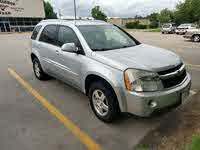 Does Anyone Own A 2009 Or 2010 Saturn Vue XR? How many miles will the Saturn Vue get? Any major problems?